The International Solar Energy Society (ISES), the IEA Solar Heating and Cooling Programme (IEA SHC) and the Solar Energy Research Center (SERC-Chile) are pleased to invite you to the ISES Solar World Congress 2019 (SWC 2019), to be held together with the SHC 2019 Conference. SWC 2019 / SHC 2019 will include a diverse selection of presentations, forums, policy discussions and business exhibits open for all participants. Join us for this landmark event. This conference will give you a chance to present your work, participate in Workshops and Forums and meet researchers, developers and industry and government actors and send you home inspired and motivated to continue moving the world towards 100% renewable energy. The 9th Edition of the International Conference on Solar Air Conditioning will take place within the framework of the ISES Solar World Congress 2019. More information will be available here shortly. Thank you to everyone who submitted abstracts! The abstract upload is closed. We would like to thank all authors for their submissions! 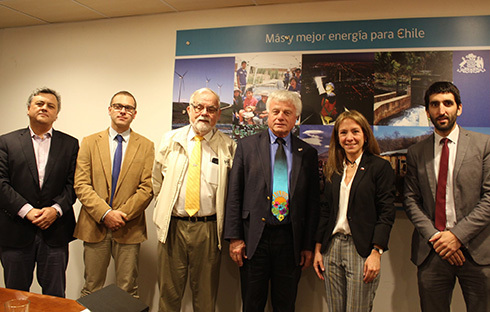 A special launch event was held in Santiago, Chile on 05 December to kick-start the Call for Participation for the ISES Solar World Congress 2019 together with the IEA Solar Heating and Cooling (SHC) International Conference on Solar Heating and Cooling for Buildings and Industry 2019. Conference representatives met with the Chilean Energy Minister Susana Jiménez for the official launch, highlighting ISES's commitment and the important role of Chile and the whole of South America in bringing the energy transformation forward. See presentation from the SWC 2019 Chair, Prof. Roberto Román L here. See the presentation from ISES President, and SWC 2019 Co-Chair, Dr. David Renné here.